Weekend wishlist – which one’s your favourite? I absolutely adore hats, and berets are probably my favourite hat-style. I’ve got lots of different colours, but this gorgeous blue would probably complete my collection! I’m really loving yellow at the moment (as evidenced by this To dye for board) and when I saw this yellow corduroy (one of my fave fabrics) skirt I knew it had to go on this weekend’s wishlist. My ‘lugging everything about’ bag is shown its age, so I’m thinking a yellow satchel would be a perfect replacement. And finally, I really love vintage bikes. I’m not a very good cyclist (my balance is pretty off), but I feel a bike like this might inspire me to create some pedal power. You can buy new old-style bikes (does that make sense?) – I’d need one that could take a baby seat on the back! I have a ‘big’ birthday coming up next month, maybe if I start dropping some very unsubtle hints..? 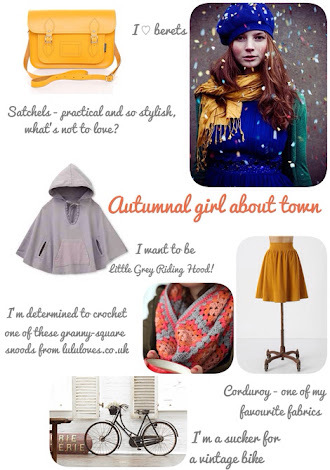 PS you can see all these images, and find out where they came from on my Autumnal girl about town board. Oh blimey, I’m probably too late now. I’ve got a Giant Expression. It’s fabulous. Really comfy to ride and very lightweight frame so easy to pedal. Be careful, some bikes are really heavy. Love your new blog layout, how have you done it?! I too love a vintage bike but would prob not get round to using it enough! Not coming to join us in Dorset are you, Ali? Best of luck wherever you’re moving to, it’s always an extremely nail-biting time! Love the poll idea, and love the options. As a crocheter I had to go for the snood, and besides – I have very poor balance so my bike riding is limited to those at the gym that don’t topple over! lol!